Frogtown Acres - Have a Wonderful Good Day! Welcome to Frogtown Acres! 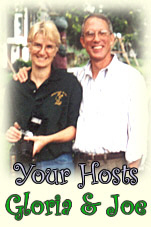 Our charming Bed & Breakfast was built around 1810 and is nestled amidst Amish farmland in historic Lancaster County. On this rustic country estate, you will find the Guest Inn, an activity center with free Wi-Fi, and look for us on Facebook! Our delightful inn was once a Carriage House of this estate. Each of the four guest rooms has its own decorating theme and is furnished with items that beckon you back to another time. The rooms are, of course, equipped with modern comforts such as air conditioning, private baths and private entrances to make your stay carefree and relaxing. Throughout the inn you will find antiques, quilts, fireplaces and paintings by local artists. You will be greeted each morning with a scrumptious breakfast in the Main House. Our breakfasts include fresh fruit, home-baked Amish breads, and a special daily entree served with fresh herbs from our garden. As you sip a piping-hot beverage, you'll hear buggies plodding by or maybe even catch a glimpse of our Amish neighbors at work in their fields. At Frogtown Acres, you can't help but notice the little guys that give us our cheery name. Our extensive collection of frogs have made their home all around our estate. We hope that your stay will find you as comfortable and relaxed as our own little, green friends. Remember, if you stay with us a night or so, we can get you discount tickets for Sight and Sound Theatre productions!